Heh. 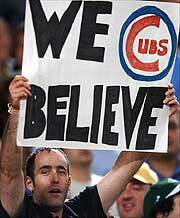 This Cubs fan ain't rejoicing. And it's not the batting average and strikeouts either. or the fact that we chose him over pitching? The fact that Lou is going to continue the braindead strategy of batting a guy who averaged 41HR with only a .325 OBP over the last two seasons in the leadoff spot. Wasted production. Lou Pinella == Dusty Baker. I don't care as much about the money (I hear there's plenty left to spend on pitching) although... 8 years for a guy on the wrong side of 30 is absurd. I heard a rumor that the last 2 years are option years... I certainly hope that is the case... but I can't imagine the terms will be favorable. I think this was a classic case of Mr. Hendry outbidding himself. I can't imagine a sane GM giving Soriano 8 years. When was the last time ANYBODY got a contract that long? A-Rod? Nevermind anything I said. Pierre getting 5/45 just proves that the market has gone completely stupid.